CHILDREN'S COMEDY. It’s just three days until Christmas, and all Crink Holly wants is to spend time with her parents, Elga and Blerg. But the Christmas season is always the busiest time of the year. 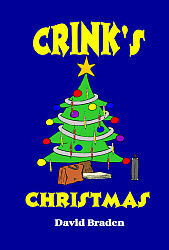 You see, Crink’s parents are elves! And not only that, Santa has just given them big promotions at the toy factory. Elga is now Santa’s “Secretary to the Secretary of Secretaries.” And Blerg holds the prestigious title of Santa’s “Supervisor of Getting Everything Everywhere.” With so much to do to get the world ready for Christmas, there’s not much time left for Christmas festivities at the Holly household. So Crink decides to create her own Christmas fun with the help of her magical Fuss Buster machine. This heartfelt holiday play shows that Christmas means more than just toys. Perfect for grade-school performers!